Ribeye steaks served with a red wine reduction sauce is bound to bring smiling faces to the dinner table. This recipe uses a reverse sear method to ensure juicy, perfectly cooked beef. A simple pan sauce brings the entire dish together with incredible flavor. This post is sponsored by Terra d’Oro Winery. All opinions are my own. My local butcher had beautiful 2″ thick ribeye steaks available, and while we don’t always eat red meat at our house, I declared this day a special occasion. This recipe uses an ingenious method called reverse searing, to ensure perfectly cooked meat with a beautiful golden-brown crust. If you haven’t tried the technique, it’s a little culinary insurance especially with more expensive cuts of protein. The hallmark of ribeye steaks is the stunning marbling and strong beefy flavor. To capitalize on this cut, I made a sauce from the pan drippings. In this case, a bold red wine reduction sauce to complement the steak. If any additional convincing is needed, the Zinfandel used can be enjoyed as you cook and paired with the finished dish. Fire up the oven and stove, and let’s get sizzling! Ribeye steak is a thick, juicy, and tender cut of beef from the front part of the loin of the rib primal section. You can purchase it boneless or bone-in. It’s a relatively quick cooking steak with generous amounts of marbling, which provides a robust flavor. Selection: There are different quality grades of beef, the most commonly found in the market are USDA prime, choice, select, or standard (the store brand meat). I recommend USDA prime if budget allows, as it has the most abundant marbling. Otherwise, USDA choice will have a pleasant taste as well. Thickness: Buy ribeye steaks that are at least 1 1/2 to 2-inches thick for the best cooking results using the reverse searing method. This will ensure the right doneness in the center and prevent overcooking. Cooking: Traditional methods use a pan-frying technique, however after being introduced to the reverse searing method and testing it out, it’s my preferred way to cook a high-quality piece of steak. Temperature: Using a digital meat thermometer after baking, target an internal temperature of 90 to 95ºF (32 to 35ºC) for medium-rare or 100 to 105ºF (38 to 41ºC) for medium. After searing the steaks, target 120 to 125ºF (49 to 52ºC) for medium-rare, or 130 (50ºC) for medium. Resting: After about 10 minutes, the meat temperature should increase about 5 degrees after resting from carryover cooking. This process allows the juices to redistribute inside the steak evenly. There are tons of flavors created in the pan while searing steak. Don’t let it go to waste! A simple red wine reduction can be made into a delicious sauce by sauteing garlic and shallots. Now for the fun part! Open up that bottle of red wine if you haven’t uncorked it already and get ready to add some to the sauce. I’m very selective with the varietal of wine to complement the flavors of the beef. I chose Terra d’Oro 2015 Zinfandel, their flagship wine crafted from hand-selected grapes from the vineyards in Amador County. The wine is simmered down in the cast iron skillet until all of the incredible flavors are concentrated. You can taste the subtle caramel notes, ripe fruits like raspberry, plum and currants, and exotic spices like clove, allspice, and cinnamon transferred from the wine right into the sauce. The sauce is further reduced with fresh rosemary, thyme, balsamic vinegar, and some beef stock until a thickened. Just a small amount of acid from the vinegar brightens and heightens the flavors of the wine. A swirl of butter whisked in adds a little more richness to the red wine sauce right before serving. It’s lovely! What makes Terra d’Oro 2015 Zinfandel selection interesting is the science behind the winemaking process. Not only are the grapes handpicked, but the winemakers also allow the crushed grapes to cold-soak for three days. This allows the water to break down the cell walls of the grape solids, which means that more flavors, colors, and aromas are extracted into the wine. It’s fascinating! The flavor building doesn’t stop there, after gentle pressing the wine is aged for 14 months in French, American, and Hungarian oak. This bold yet balanced red wine has a smooth finish with just the right level of tannins. It truly highlights the unique taste of the Amador Country region that is a must to explore! Towards the end of cooking, melted butter is used to baste the steaks briefly. This process helps to distribute aromatic flavors from the garlic and shallots to the surface of the beef. Basting with hot butter also encourages even browning due to Maillard Reaction. A bonus is the milk solids in the butter enhances the golden color formation. 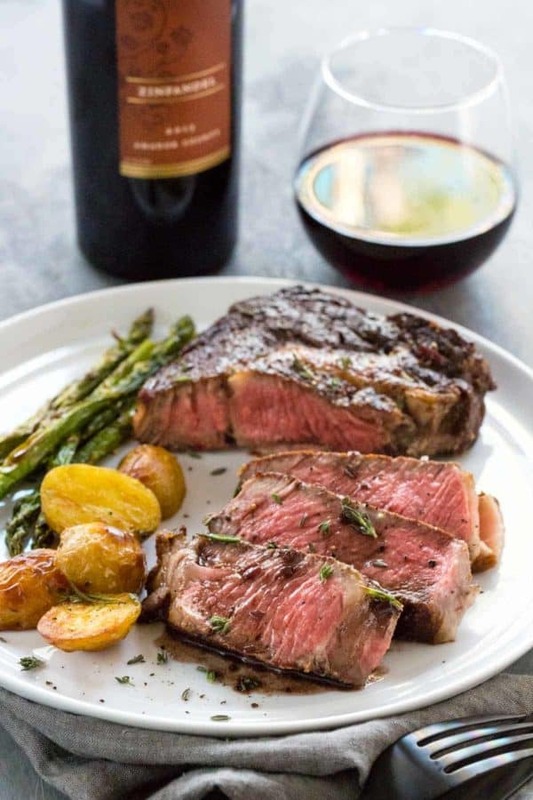 Thick cut ribeye steaks served with a simple red wine reduction sauce. This recipe uses a reverse sear method to ensure juicy, perfectly cooked beef. Line a sheet pan with foil and place a wire rack on top, set aside. Adjust oven rack to the center position and preheat oven to 275ºF (135ºC). Place a large 12-inch cast iron skillet in the oven to warm. Dry the steaks with a paper towel to remove excess surface moisture and transfer to the wire rack. Generously season the meat with salt and ground black pepper on both sides. Place steaks in the oven and cook about 15 to 25 minutes, depending on the thickness. Remove the steaks from the oven and set aside. Remove the cast iron pan from the oven and transfer to the stovetop. Heat pan over high heat and add the oil. Once the oil is very hot and just beginning to smoke, carefully add the steaks to the pan. Sear the first side until a deep brown crust is formed, about 2 minutes. Carefully flip the steaks over and sear about 1 1/2 to 2 minutes. Use tongs to turn the steaks on their sides to cook and render remaining fat on the sides, about 2 minutes total. Add one tablespoon of the butter to the pan, melt and use a spoon to briefly baste the tops of the steaks with the butter. Transfer ribeye steaks to a clean plate and allow to rest at room temperature for 10 minutes. For the red wine sauce, reserve 1 tablespoon of the steak drippings in the cast iron pan and heat over medium. Once the drippings are warm add the garlic and shallots, saute and stir frequently until tender, about 1 minute. Add red wine, balsamic vinegar, rosemary sprig and thyme sprigs, bring mixture to a rapid simmer over high heat. Allow wine mixture to reduce until thickened, about 1/4 a cup, 3 to 5 minutes. Add in beef stock, and rapidly simmer over high heat until the sauce is reduced and thickened to about 1/2 cup, about 4 to 5 minutes. Remove rosemary and thyme, discard. Turn off heat and whisk in 1 tablespoon of butter. Taste the red wine sauce and season with more salt and pepper as desired. Garnish steaks with chopped thyme, rosemary, and parsley a few minutes before serving. When steaks are in the oven, I recommended checking the temperature of the steaks using an instant-read thermometer at 15 minutes, then every 5 minutes until target doneness is reached, 90 to 95ºF (32 to 35ºC) for medium-rare, or 100 to 105ºF (38 to 41ºC) for medium. When steaks are searing, aim for an internal temperature of 120 to 125ºF (49 to 52ºC) for medium-rare, or 130 (50ºC) for medium. Glad to see you adopt the reverse sear tech. I’ve been using it for years either at the grill or in the kitchen with cast iron pan and oven. The only way to cook a chunk of meat that will be seared. Montevina winery is one of our favorites especially their old vine zins. Next up try rib eye via sous vide and searing. Spectacular. Great to hear that you a master at the reverse sear method Dennis! Love the idea of grilling the meat after warming as well, definitely will try that soon. Yes, Montevina has excellent wines! Sous vide is also on my list to do for techniques, yum! Ooh ooh ooh Jessica. I have all the ingredients except the wine. I need to get on line and see who sells it in Stockton. Cannot wait to make this. Thank you so much! I love your recipes and adore what a wonderful person you are. I can’t wait for you to make it Judy! You can actually buy the wine directly from the Terra D’oro website, and it will be shipped directly too you 🙂 Let me know if you can find it! I checked it out Jessica and see that Walmart has it. I was surprised BevMo doesn’t carry it. I was looking for a different way to cook some ribeyes and came across this recipe. It is now my favorite way to cook them. It looks like it is going to be difficult but it is actually a lot easier than other ways I have tried and the end result of this is so much better! I’m currently living in Texas where ribeye is less expensive (3.99 a pound last week) so I find when I want a steak that’s that I reach for. Awesome recipe! Thank you Emma! Wow, that price is incredible, I would eat ribeye everyday, ha. So happy you tried the recipe and enjoyed the results! 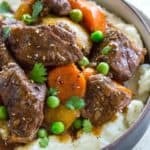 My husband and I loved this recipe! The sauce was *amazing*. Quick question, how do you keep your steak warm? I didn’t want to tinfoil it, I worried it would over cook. It was warm, but not piping hot, though. You are a genius! Best easiest and tastiest recipe! I’ve successfully made this twice now and will continue to use this recipe. The wine sauce is delicious. I am now a ribeye steak expert! So the steaks cook at 275○ ? And they are in the oven with the cast iron pan? Yes, the steaks cook in the oven at 275ºF, check in the notes section the target doneness temperature. It cooks on a wire rack set on a sheet pan in the oven and then is transferred to a hot cast iron skillet on the stove.